Hi, My name is Javier Rosas, I am an Olympian triathlete in Athens 2004, in 2008 I moved to the coaching area and training as a Master, as a Master I did 5 Ironmans and 2 times Kona, 2010 and 2012 (just training 12-14 hrs a week), IM PB IM 9:07. 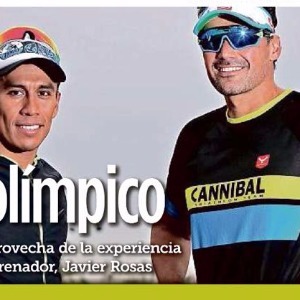 As a coach I train a large group of triathletes particularly a group called Cannibal Triathlon Team, best Team in Mexico with one Olympian 2016 in RIO - Irving Perez and one Ironman Kona World Champion 2016-Larissa Rabago. -COACHED MORE THAN 300 TRIATHLETES FROM BEGINERS TO ELITES. GOLD MEDALLIST HUATULCO WORLD CUP 2015 (THE ONLY MEXICAN THAT HAS WON IT, THE HARDEST TRIATHLON IN THE WORLD CUP CIRCUIT), ALSO BRONZE MEDALLIST IN 2013. -I HAVE STUDIED FROM WHEN I WAS A JUNIOR, ALWAYS READING AND PUTTING IN TO PRACTICE IN MY SELF AND FRIENDS,THEN I STUDIED IN FMTRI COACHING PROGRAM, AND THE MOST IMPORTANT THING TRAVELLING AROUND THE WORLD ASKING AND WATCHING WHAT WORKS FOR ATHLETES FROM THE BEST ATHLETES AND COACHES. ALL ATHLETES, ALL LEVELS THAT WANT TO SET A GOAL ARE WELCOME. Success. Coach Javier Rosas has been notified of your message.